Politics and emotions collide in Friedrich Schiller’s Mary Stuart when Queen Elizabeth I must decide how to tackle the threat posed by Mary, Queen of Scots. Some advisors suggest it is better to execute the imprisoned monarch to prevent her from being a rallying point for Elizabeth’s enemies, while others feel this will invite opposition by making a martyr of her. The human factor also comes into play as Elizabeth feels disgust at the thought of executing a fellow Queen, but insulted by Mary’s verbal and physical attacks. Needless to say, this is a thematically rich piece, and in the end Elizabeth never reaches a firm decision one way or the other. 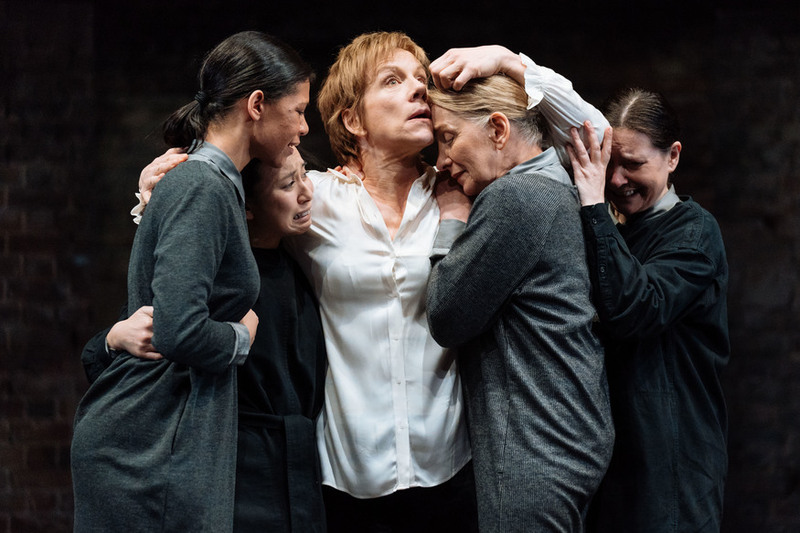 Robert Icke’s new adaptation, first seen in 2016 at the Almeida Theatre, emphasises the fact that these two women are fighting in a predominantly male world by paradoxically putting everyone in modern dress. The main parts are played by Juliet Stevenson and Lia Williams, but who takes which is decided each night on the spin of a coin at the start of the evening. This emphasises how these two characters are in many ways the same, and the large element of chance involved in ensuring their fates should be so different. The fine acting both display puts the icing on an excellent production of a classic play.